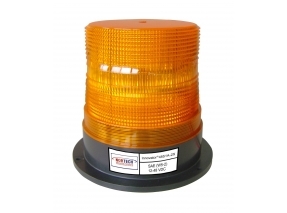 Our Innovator series of High Profile 6 1/4"(15.9cm) Strobe beacons is a popular model for utility, municipal and costruction fleets. New innovative polycarbonate base features both flange mount and pipe mount options. 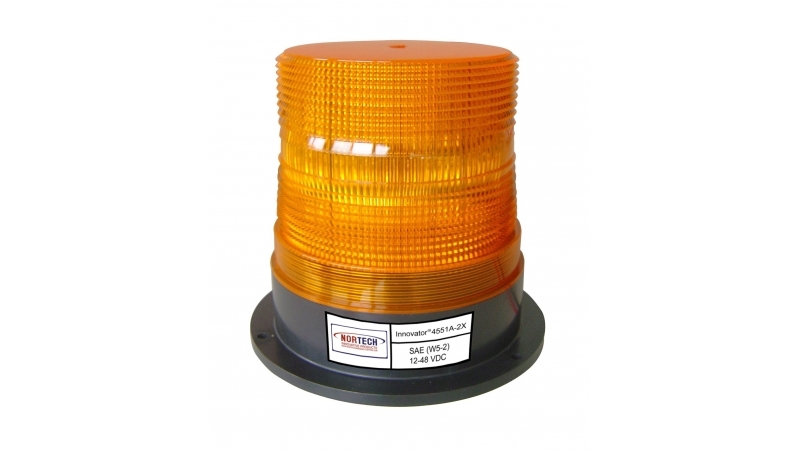 Low maintenance strobe beacon with replacable flash tube by unscrewing the lens and unfastening safe tight screws. The circuit board is completely potted to seal out environmental contaiminents and prevent road shock. Polycarbonate lens with our Innovative flat-style o-ring for 100% true weather tight seal. 10 Joule, meets SAE J1318 Class 2 requirements. Amber, 2X flash, permanent mount beacon. Blue, 2X flash, permanent mount beacon. Clear, 2X flash, permanent mount beacon. Green, 2X flash, permanent mount beacon. 4551R-2X Red, 2x flash, permanent mount beacon. Amber, 4X flash, permanent mount beacon. Blue, 4X flash, permanent mount beacon. Clear, 4X flash, permanent mount beacon. Green, 4X flash, permanent mount beacon. 4551R-4X Red, 4x flash, permanent mount beacon.